Not a lot up top this week since the chock full late post on the weekend. I did want to mention that the $20K at Portland Meadows last weekend nearly doubled the guarantee (damn you, Sunday special tournaments!) with almost 300 entries. If you (or someone you love) have always wanted to play a multi-day tournament with a good structure in a fancy environment, you might consider taking a flier on one of the nearly two-dozen events at this year’s (no longer Doyle Brunson) World Poker Tour Five Diamond at the Bellagio, starting the day after Thanksgiving and running through 10 December. Sure, several of the events have buyins of $5K and $10K (though there are satellites into those) and there’s a $50K, but there are seven open non-satellite side events at $1,090 or $1,600, plus a seniors tournament at each of those buyins. The side events include PLO, a NLHE 6-Max, and a NLHE Shot Clock tournament, as well as a Turbo at the end of the series. There’s even a $560 buyin event. More importantly, these tournaments don’t have particularly large fields. Last year’s $1,090 PLO tournament got just 135 players, and even the NLHE events only had a couple hundred players each. 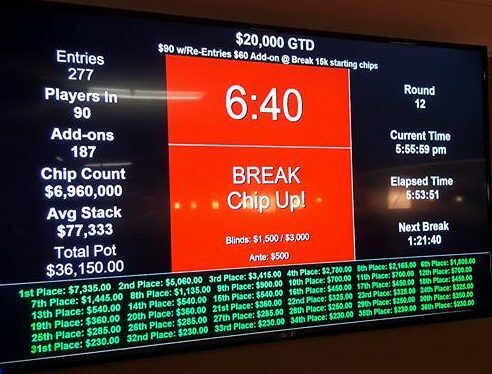 Aside from the $560 tournament (which got just over 300 entries last year), the biggest field was 233, which paid 27 places and $53,000 for first place. You stand to make a little more for your cash in one of these fields due to their smaller size, and you’re paying less rake, so the buyin to prize pool ratio is better. 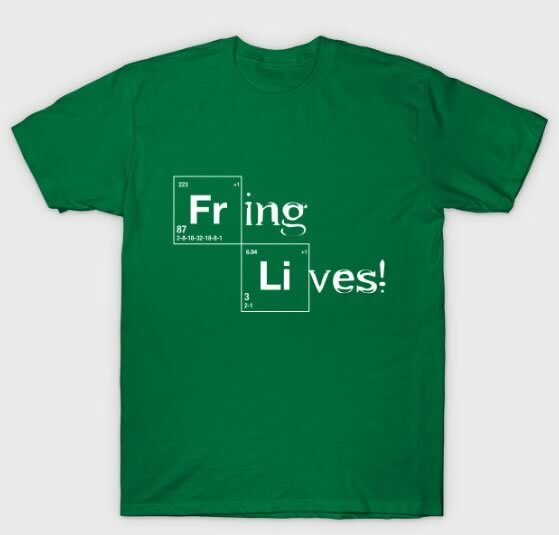 You people are killing me! There’s nothing I love more than a freezeout tournament (except for a Survivor tournament). It’s one of the purest forms of tournament poker and I rue the day when someone added “re” in front of “buy.” But Sunday is one of those family days for a lot of us, so I’m going to be missing this one. No need for you to if you don’t love your family. This Sunday’s $15K Freezeout at Portland Meadows will be the last big event in town before the Wildhorse series in Pendleton starts. Next week is the regularly-scheduled First Friday $20K at Final Table, which technically is after the start of WIldhorse, but it’s just conflicting with the first day. Last change to spin things up before the series. LATE ADDITION! I somehow managed to let Run It Up Reno slip off my calendar, but its Main Event is this weekend, with $600 entry days Friday and Saturday to their $100K guarantee. Plus $125 O8/Stud 8, PLO/NLHE, and 8-Game (all 6-Max) running through Sunday, along with more. Nothing scarier than a Reno Halloween! At the Venetian Deepstack Extravaganza this weekend, there’s a $600 buyin NLHE bounty event (2 days, starting Friday and Saturday), and a PLO/PLO8 $9K guaranteeon Sunday evening. Monday, Tuesday, and Wednesday are starting days for a $400 buyin $150K guarantee. The World Series of Poker Circuit at Harvey’s Lake Tahoe has three entries days to their first big event on Friday, Saturday, and Sunday. Monday is the $365 6-Max, Wednesday is the Monster Stack. The Main Event starts next Friday. The Tahoe stop is one of the best for ring-hunters; last year their Main Event got fewer than 500 entries compared to the 1,300 that were in the Main at the Horshow Casino in Indiana this week. HPT St. Louis is under way, with its opening $100K guarantee ($350 buyin). The Main Event starts next Friday. The Rio Final Table Festival starts tomorrow with a mic of has $500 and $300 NLHE events, and a $1,100 satellite into the 2-day $10,000 main event on Monday (Halloween). Several other satellites to both the Main and smaller events that are running through the weekend. 30 October at Muckleshoot Casino is the Fifth Sunday special, a $330 buyin with $3K added to the prize pool. Game starts at noon. An hour earlier on 30 October (11am) is also the Tulalip Casino LSOM tournament. It’s $345 with the dealer toke, and has $5K added to the prize pool. The Mid-States Poker Tour wanders west to Golden Gates Poker Parlour in Blackhawk, Colorado. Satellites start Halloween, but a $360 buyin $100K guarantee starts Thursday, 3 November, with the $1,100 buyin $200K guarantee Main Event (though I hate seeing asterisks after that number when I can’t find what it’s for) kicking off 10 November. The Wildhorse Fall Poker Round-Up also begins 3 November. Individual tournaments are listed on the calendar. The final leg of the SoCal Poker Championships is at Commerce Casino’s LA Poker Open. The first event is 4 November, followed by eight days of starting flights for the $350 buyin $3M guarantee SCPC. The LAPC Main Event has $100K guaranteed for first place with a $1,650 buyin. The HPT moves across Missouri to Kansas City on 10 November art the Ameristar Casino. Seven events, with three entry days for the $1,650 Main Event. #PNWPokerCal Planner for 19 October 2016 — LATE EDITION! The week I’m busy at work and don’t get things together early in the week and there’s actually stuff to mention in the Planner! On the other hand, some of it I didn’t get wind of until after my usual Wednesday morning post time, so hopefully all’s good. A couple people mentioned they were wondering what had happened when there wasn’t anything new on the site the other day; I’m touched and pleased that people actually look for this little blog on a regular basis. I will try hard not to let it happen again! One thing my late post gives me great pleasure to be able to report on is Joe Brandenburg’s World Series of Poker Circuit win at Horseshoe Hammond, in East Chicago Friday night. Joe’s a mixed-game player, who holds his own in hold’em. I’ve played with him a fair amount over the years, and as a computer programmer myself (though less accomplished both there and on the poker field) I have to admire his skill, not to mention the fact that he and his daughter Liz Tedder can crush tournaments. Did my best this summer to give them both a little notice in the live reporting. Is There Still Live Poker In Portland? Last week, I asked this question when I mentioned not having had the opportunity to play much off-line poker for the past couple of months. My first game after the Fall Coast Classic Main Event lasted four hands. Last week, I got out to Portland Meadows for the first time since August (more on that below) and got through a whole level! Then last night I played the weekly Friday night $10K Guarantee at Final Table, and it sure seemed as if things were running just the same (from a player perspective) as they were before the summer mishegas. 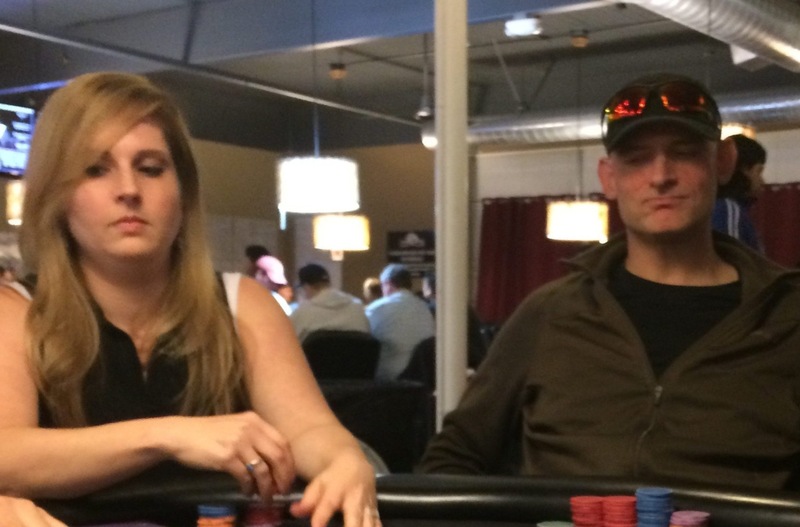 Lisa Meredith and River Rich at the Final Table $10K. I got there about 45 minutes into the tournament and noticed first thing that there are new “2 Hour” designations on most of the parking spaces in their lot. Parking has been less of a problem for Final Table than it was for Encore, but their customers do tend to soak up lot space in front of other businesses, like Pizza Baron and O’Reilly’s Auto Parts, as well as the rest of the strip mall. I meant to ask how that affects daytime customers. First hand I played, AxQx, I raised over a couple of limpers and got four callers, flopping QxQxJx, c-bet, got raised by one caller, went all in and he called with AxJx. Qx on the turn for quads and a good start to the night. Hit a set of tens shortly after that, got up to three times the starting stack in less than half an hour. Twenty minutes later, after losing a chunk with a pair of tens, then a flopped set of nines where I somehow let 5♣2♣ get to the river to catch a flush, I was back just above start. For several hours, I was playing just upstream from Lisa Meredith, the 3rd-place finisher in this summer’s WSOP Millionaire Maker. She was unaware of the Pacific Northwest Poker Calendar (#PNWPokerCal), but when she said she was looking for value in large poker tournaments, you know I spent some time plugging the site. Vicarious Living Through the Success of PNW Poker Players™. Got up to 90+K at one point—about 150% of the average stack at the time—but ran AxKx into 6x6x on a flop of Ax6x5x and lost half my stack, never to recover. Went incredibly card-dead sub-10bb, and busted along with another player on a confrontation with QxTx v AxKx v 9x9x, with the big stack taking it all after a king showed up on the board. Almost made a straight. Had a nice chat with Brian Sarchi, the man behind the Portland Meadows Poker Room the other night (after busting a tournament and cash game in short succession). He said things are moving along well there, with weekday noon games more than doubling guarantees. The evening game I played had a $1K guarantee and $1,780 in the prize pool. Brian mentioned that Meadows hasn’t got any big events in the immediate plans (but there is a $20K at noon on Sunday, 23 October) but they have been settling into their operation. The poker room has taken over the food and drink operations from Portland Meadows proper, and Brian said they’re planning to bring in a chef. There were three tables running in the live section on a Thursday night. Things seemed to be humming along much the same as they were in the first part of the year, but then I probably spent more time talking to Brian than I did actually playing poker that night. I’m still looking for that angel investor to send me to the last EPT Prague. When most people plan on their trip to Pendleton for the Fall Poker Round-Up at Wildhorse Resort and Casino—the largest series in the Pacific Northwest for many years running—they plan for the $545 Main Event on the closing weekend, with maybe an opening shot at the $335 tournament the day before. Last year’s Main got 379 entries, with a prize pool of $190K and made a nice bundle of $42K for Minh Leadao, who’s spent the year since taunting his Facebook followers from exotic locales in SE Asia and Australia. But like with most other large-field tournaments, if you didn’t make the final table, you probably didn’t even even triple your money. Thirty-six places paid, and 18th got $1,351for a profit of only about 150%. The cost of the High Roller has been dropping since the first one three years ago. They started at $2,000, went down to $1,500, and this year they’re at $1,100, presumably to capture a larger number of players. Even better, Wednesday night during the series (9 November), there’s a $225 Super Satellite for the High Roller, so you can potentially get a seat in the High Roller with 1 in 5 players in the satellite getting a ticket. Head out Wednesday with the money you could have spent on the Main, play the High Roller satellite, and if you don’t get a seat, play the $225 noon event running concurrently with the High Roller instead. And save on weekend hotel rates. That’s high-rolling! The SoCal Poker Classic hits the Hustler Casino next Friday as part of the Liz Flynt Fall Classic. The Main Event is a $240 buyin $200K guarantee with eight starting flights beginning the day before Halloween. The Beach Poker Club in Eugene has its last two events for its Grand Opening tomorrow, with a $49 NLHE Battle of the Sexes Freezeout at noon and an $89 buyin, $25 addon Turbo event at 5pm. The next Venetian Deepstack Extravaganza starts Monday and runs through Thanksgiving. It opens with a $150K guarantee $250 buyin and has a total of 56 events. 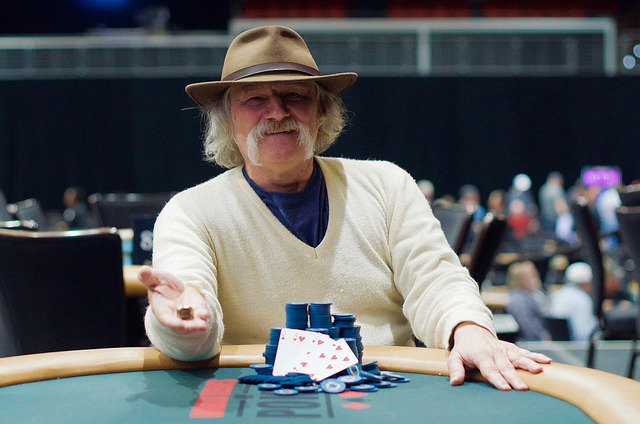 The World Series of Poker Circuit holes up at Harvey’s Lake Tahoe on Thursday, 27 October. It’s one of the smaller-turnout venues for the WSOPC. By contrast, St. Louis is a big destination for the HPT, and its first event is the same day, a $100K guarantee with a $350 buyin. There was a late announcement of the Rio Final Table Festival at the home of the WSOP over Halloween weekend. Friday has $500 and $300 NLHE events, with a $1,100 satellite into the 2-day $10,000 main event on Monday (Halloween). Several other satellites to both the Main and smaller events that are running through the weekend. Five years ago, I was on a mission to get to EPT Prague for my 50th birthday in December. Poker, a big birthday, and snow in St. Wenceslas Square for Christmastime! What could be cooler? Needless to say, after Phil Laak crushed my dreams at the Venetian, I didn’t make it, and now—with PokerStars rebranding their various tournament series around the world—this year will be the last EPT Prague. SO I’ve only got a couple of months to get things together. Then again, if any devoted readers want to spring for a great birthday gift, just drop me a message @pokermutant on Twitter. A week and a half since the Ignition Casino deposit, and no problem with the check bouncing yet. I wrote up the first of the two Thousandaire Maker tournaments I cashed in the other day as Three Hundred Dollars an Hour. I had one of those aggravating-even-when-positive results the other day in a $55 buyin, $50K guarantee turbo. 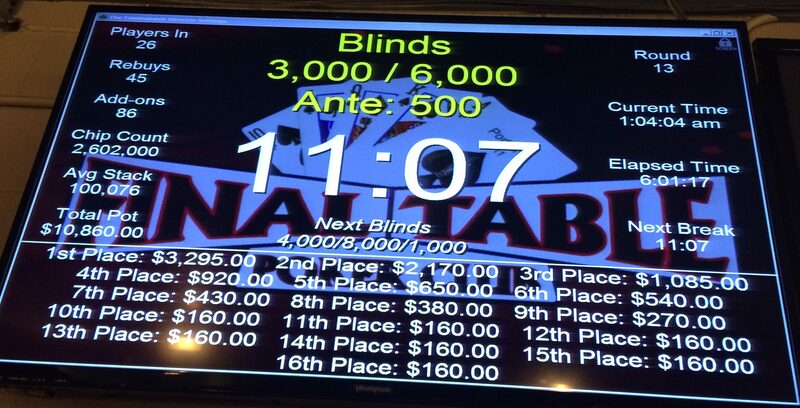 There was an $8.6K overlay with 828 entries, with a little more than that set for first. We were down to 19 players when this happened. Is it time to start naming name? Asking for a friend. The Beach Poker Club opened last week in west Eugene with a big party and a 7-day schedule of at least two tournaments a day (including PLO on Tuesdays at 6pm). According to a post on Tuesday morning, they’re planning a 5-day series 19–23 October, with the schedule to be announced. Except for a home game, I haven’t had a chance to play live since mid-September. Didn’t make the $20K at Final Table because of work, but I’ve been playing online a lot. Got a concert to go to this Friday (no Final Table for me!) and something that’s going to keep me from playing the big game at Portland Meadows yet again. Is there still live poker in Portland? If you’ve got $3,000 burning a hole in your pocket, you’re in luck, because I have a way you can use it (assuming you’re not donating it to me EPT Prague fund). The Heartland Poker Tour hits Sacramento’s Thunder Valley Casino this weekend, but the big event is next weekend: a $500K Guarantee, $2,500 buyin Championship event with three starting flights. It’s a three-day tournament, with a televised final table (played on Monday, 25 October). Last year’s Thunder Valley Championship had just a $1,650 entry fee but still put up a prize pool of $672K, with more than $150K for first. You can still find round-trip flights to Sacramento for less than 400 thjat get you there before noon when the tournament starts (though there aren’t many direct flights left). ALternatively, if you’ve got the time or a couple of people to travel with, the drive is about ten hours. Alternatively, if you don’t want to drive., you can catch an overnight Greyhound bus at 6:25pm in Portland and get to Sacramento at 6:45am ($107 each way) and take a nap. Still need to get out to the casino and find somewhere to stay. Thought I was going to get to Final Table’s Wednesday $1K Bounty game but if you follow the blog, you know that it’s waaay past its usual post time, so that’s not happening. Rialto still has cash games every night, there are the afore-mentioned $10K games (Final Table 7pm on Friday and noon at Portland Meadows on Saturday). No big series announced to take the place of the fall EPS—and I haven’t heard a peep about the $200K guarantee Final Table planned before this summer’s unpleasantness—but maybe I’m just out of the loop. It’s ig Poker Oktober at LA’s Bicycle Casino through next week. Saturday, Sunday, and Monday are starting days for the CardPlayer Poker Tour Main Event, a $400K guarantee with $1,100 buyin. The HPT kicks off its Thunder Valley Championship stop starting tomorrow with the $425 buyin, $250K guarantee Monolith. As mentioned above, the Main Event next weekend has a $500K guarantee. Kennewick, Washington hosts the Tri-Cities Poker Championship Friday through Sunday at Lucky Bridge Poker. Eugene’s Full House Heads Up Championship runs Saturday and Sunday. WPTDeepstacks San Diego opens at the Oceans 11 Casino on Saturday; they have a $200K guarantee Main Event with starting days next Thursday, Friday, and Saturday. The next Venetian Deepstack Extravaganza starts Monday, 24 October and runs through Thanksgiving. It opens with a $150K guarantee $250 buyin and has a total of 56 events. That’s roughly the payoff for cashing one of the top prizes (which is usually all but one of the prizes) in a Thousandaire maker, one of the Survivor-style tournaments on Ignition. The buyin is $75 with a $7 fee, and the payouts are each $1,000, with a $5,000 guarantee. As in other Survivor tournaments (or satellites), any money left over after each of the standard payouts goes to the next player, e.g. if there’s a prize pool of $7,575 (101 entries) there would be seven $1,000 payouts and an eighth of $575. I had the good luck to cash in two of this past week’s Thousandaire Makers; here’s how things went down in the first one. I joined the game just past the half-hour mark. You start with 2,500 in chips, the blinds were up to 30/60 (Level 3) and about to go to 40/80. Levels are 12 minutes, roughly the equivalent of 25-minute rounds in a live game. Tables are nine-handed. I folded A♣T♠ in the hijack on Hand 10, but I’m UTG1 a couple hands later and raise to 240 (about 10% of my stack after paying the blinds) with A♦3♦. The raise gets through and I win the blinds. J♦8♦ and 9♣6♣ go by without a squeak in my blinds, I fold A♣2♣ on the button even when there’s no action. On Hand 18 I I raise to 300 (at 50/100) with K♠A♥ from UTG2. HJ calls with 3♠3♣, then SB wakes up with a short stack and K♣K♥. He shoves for 1,700. I make the call, HJ folds, and the board runs out Q♦8♣2♠J♠7♠, leaving me with ace high and just 7.5bb. Nobody has anything on my big blind hand, so I pick up the small blind ‘s chips when he folds T♣3♣ to me. The best hand of the lot was Q♥9♥ UTG1. At this point, most everyone at the table has 3,000 to 4,000, with a couple stacks under 2,000 (aside from me) and the big blind, who has nearly three times the starting stack. I lay low until Hand 31. It’s my small blind, the blinds are 50/100. I start off with 650 chips after paying both blinds since the last hand I played, and I have the Mutant Jack: A♣J♣. HJ has T♠T♦ and raises to 300 from a stack of 2,200. CO has 6,400 and calls with 9♣Q♥. I jam all my chips in. Big blind lost a huge portion of his chips a couple hands earlier, he’s down to 330 chips, and he shoves 5♠4♦, hoping for the kind of magic that didn’t come when he got it all in with K♥9♥ with both a king and an ace on the flop. UTG shoves with his tens and CO fold his speculative hand. The board runs out A♠9♥3♠5♣7♦, and I pick up the pot. It gets me back to spitting distance of the starting stack. Hand 39 was my next strike. I had 1,700 and K♠A♠ on a new table where nobody had more than 5,550. Blinds were 75/150. I shoved with just over 11bb, CO re-shoved 2,250 with T♣T♠, and we saw the flop heads up with me hitting the king on the flop: K♣7♦5♠3♥3♠. The double up put me at 3,650. CO min-raised my big blind on Hand 42, with J♠T♥ I called with Q♦9♠ and flopped top pair: Q♣6♦2♠. We checked the flop and he bet his straight draw when the K♠ came on the turn. I folded. I was in CO with A♥9♥ on hand 45. The blinds were up to 100/200, I raised to 600, and nobody called. By now, I was third in chips at the table. Hand 55. I raise UTG1 with A♠8♠ to 750 and the dealer (qs kh]) and big blind ([qhjs]) call. There’s no bet after either the flop, turn or river—we check it down to 7♣5♣2♣9♥4♦ where my ace-high wins. On my next HJ, Hand 62, I get A♦K♥. I open to 750 and get called by the big blind, who has K♣Q♥. He folds to my c-bet of 800 after I make top pair on the A♣5♣4♠ flop. I call from the big blind myself on Hand 65 with T♥9♠. Looser than I normally play with a full table, but I was heads up facing a min-raise. I folded to a bet of 500 on the K♦6♥4♥ flop, he had top pair and the flush draw with K♥Q♥. Blinds are 150/300/25, I raise A♥6♥ to 900 in the CO on hand 68 and everyone folds. Three hands later I’m in the big blind with K♣3♣. HJ limps in with 4♣4♥ and we see the flop heads up. I check 3♦3♠T♦ , he bets 600, and I come along with my trips. I check the 6♠ turn to see if he’ll put anything else in, but he just checks. The river is the 9♥. I bet 1,000, a little more than half the pot, and HJ calls within 10 seconds. On the button with K♥K♣ on Hand 73. HJ raises to 900 with J♠T♦ off a stack of 10,900. I start with 7,200, and raise to 2,000. HJ calls. I make top set with a flop of K♠Q♥2♣. HJ checks, I bet 2,200, knowing it’s probably all going in on the turn, and HJ calls with an open-ended straight draw. The turn is the 3♥, HJ checks, I put in the last 3,000, and HJ calls. The river 7♣ misses his draw, and I double up to 15,000. Hand 80 and I have 9♥9♦ in the big blind. HJ raises to 900, I reraise to 1,500, and he calls with 7♦5♦. He has just 4,500 to start. The flop is J♦5♠4♦. I bet 2,000, HJ goes all in for 2,950, and I call. The rest of the board is the wrong red for HJ: 4♥ and 7♥. He’s out and I have nearly 20,000. This is the point in a lot of satellite tournaments where you might start thinking you’re approaching a stack where you can slide into the money, but there are still eight levels to go in the tournament before it’s likely to come to an end (usually around Level 17 at 1,000/2,000/100). And since the buyin is less than 10% of the payout, you need a bit more than 10 times the buyin to be comfortable, even later in the tournament (average at the end is about 35,000). I get nines again (9♣9♠) on the button on Hand 89 and narrowly avoid getting knocked out when I open-raise to 1,200. The small blind shoves 5,200, and the big blind calls. With nearly 12,000 in the pot and me having to call 4,000 more, I make the call. There are two overs on the J♣T♣3♠ flop, and when the big blind checks, so do I. The J♦ on the turn pairs the board, and I’m pretty sure that whatever the big blind has has me beat, so after he bets 7,000 on the river 2♥, I fold, the small blind mucks A♦6♠ and big blind has A♥A♣. I get another table change on the next hand. I have 7♣7♥ in the small blind three hands later and call a raise of 1,000 from UTG1 at 250/500/50. He has A♣J♥. The big blind comes along with 9♥Q♠. We all check the 5♦3♠2♣ flop and T♠ turn. I miss my chance there to try to nab the pot. The river is the 4♣, I check and the big blind checks, then UTG1 bets 1,000 on his straight to win. Hand 100 and we’re about at the halfway point. I start with 12,400, half what my high was, but I’m above median at our table, with three players in the low twenties, four at ten thousand or less, and one seat empty. I have 2♦A♦ in the big blind, and when action folds to the small stack in the small blind, he jams 4,900. I call, he turns over J♣5♠, and the runout is Q♣4♠3♦K♣6♦, giving me an infusion of chips. Hand 114, I have A♠6♠, I raise under the gun to 1,800 at 300/600/60, and everyone folds. The table is six-handed, and I have just under 17,000. Two hands later on the button, it’s J♠J♥. Blinds are up to 400/800/80, and I open to 2,400 to take another pot. We’re still six-handed on Hand 128. I’m on the button with J♣Q♣ and my stack is down to 14,300, with the big blind at 1,000. I open-shove and get called by a short stack in the big blind who has 9,500. He shows 7♠7♥, the board runs out A♦Q♥4♥9♠K♠ and I’m back up to 24,700 after knocking out a player in 12th place. I get a walk with 3♠3♣ on a five-handed table two hands later. After another elimination, we move to the final table. I have K♣Q♠ in the HJ on Hand 161, but UTG goes all in for 4,350 and UTG1 shoves over the top for 7,700. Three of the four stacks behind me have me covered, so I elect to fold. It’s A♣J♥ versus 8♥8♣, and the board runs out A♦7♦6♣T♠9♦, making a ten-high straight for the larger stack and eliminating a player in ninth. We’re now on the bubble, with six places paying the $1,000 prize and seventh getting $450. Eighth gets nothing. The spread of chips is remarkably even for this stage in a tournament. Blilnds are 500/1,000/100. The smallest stack is 16,700, but the largest is only 32,800. People are now playing fairly tight, and on hand 149—after the big blind has risen to 1,200—I open to 3,600 and take the pot with K♦9♦. I fold 8♠8♦ preflop UTG1 on Hand 159. I’m one of only two players under 20,000 *just barely) and I don’t want to put nearly a quarter of my stack at risk from early position with a middle pair raise. Hand 168, I get A♦K♥ UTG. Blinds are up to 800/1,600/160, my stack is down to 17,000, and I shove. Everyone folds. The largest stack is still only 45,150. I get A♠K♠ in the next round on Hand 174 as UTG2. I shove again, and the infusion of chips pushes me back over 20,000. I get another walk with Q♦2♣ on Hand 177, then again with J♦5♠ on Hand 185. My next big blind I fold K♠T♣ to an all in by 3♣A♥, On the next hand (194), A♦3♥ shoves from the button and I lay down K♥Q♦ in the small blind. We’re still eight-handed on Hand 201. I’m down to 15,750, blinds are 1,000/2,000/200. Chip distribution has evolved a bit. The chip leader has 52,550. The next-largest stack is 37,000. There are a couple of players with over 26,500, three stacks in the high teens, and a single 8,000 chip stack. I’m in the big blind with A♠5♣ as the second-smallest stack when the short stack shoves from UTG2 with K♥T♣. Everyone folds and I do my duty, I hit my ace right away as the flop runs out A♣6♦2♥2♠3♠ and put us into the money. I also pick up enough chips to put me over 25,000. It’s only four hands later when the big stack opens with a min-raise and T♠8♣. The short stack calls from the big blind with A♣3♦. The flop is J♣T♣6♥, and BB shoves for 13,350. The button calls (with 35,000 behind) and the turn and river are 6♥6♣. The ten is enough for the win, the short stack gets back enough for his buyin (though not the fee), and the rest of us take $1,000 each. 205 hands. Three hours and ten minutes. +1120% ROI. There’s a continuing debate in the poker world over the advisability of playing online poker on unregulated sites in the US. Of course, there’s not much of a debate in Oregon—or most of the rest of the country—since the only regulated online markets in the States are limited to Nevada, New Jersey, and Delaware. Every dollar you put somewhere outside the reach of US law, you might be kissing goodbye (then again, Wells Fargo). That said, of the two larger sites available here in Portland since Black Friday—America’s Cardroom and Bovada—I’ve mostly played on the latter, and haven’t had any trouble with cashouts in the past. So, after moving a small amount of money over to Ignition Casino in the middle of August after getting the notice that they were going to be taking over Bovada’s poker operations, I was interested in finding out how smooth the cashout process would be, after cashing a couple of Thousandaire Maker tournaments early last week.Here’s the timeline so far. I ordered a $500 cashout by check just after midnight on Sunday night, a few minutes after the tournament ended (technically, early Monday). I got an email immediately, saying the request had been received. No surprise there, it’s auto-generated. Early Wednesday morning, after I’d written last week’s Planner (but before it was posted), I received an email saying the payment had been approved. That took approximately 50 hours. Just after 2:30 that same afternoon and just over 62 hours from the time Ignition first acknowledged my request, I got a text with a package tracking number. According to the delivery track, the truck made it to my house at 9:30 Thursday morning with the check.I was at work, and it required a signature, but I went by the house at lunch and grabbed the delivery slip off the door, then picked the package up out on Swan Island about 6:30 Thursday evening. Popped the check into my bank Friday at lunch, and the full amount was in my account on Saturday, less than a week after the request. The ATM check reader at my bank won’t process checks from outside the US, but I haven’t had a cashier even mention it (unlike when I tried to just deposit my paycheck for working at the WSOP). All in all, a pretty smooth first experience. I did experience some angst on Saturday night when after logging into the client, I saw that almost no tournaments were running, and cash tables were shutting down, but that was during the shutdown of the Bovada system at the end of September. Since then, things seem to be running as normal. That’s not to say that something couldn’t happen yet. The check could come back as unpaid. They could be paying out early withdrawals extra fast in order to make it look like they’re solvent when they’re not. I certainly hope that’s not the case, because I’ve got some money on there I’d like to run up. What do you do when you go out of your way to help someone out with a $400 poker loan after you’ve hit a decent score, they pay you back half, then after they don’t pay you the other $200 for ten months, they score way bigger than you did and are still kind of relaxed about paying you back for several weeks? Asking for a friend. At least my “friend” didn’t get dunned by the Global Poker League’s Alex Dreyfus; then again Dreyfus not only paid it back faster, he paid interest. If you’re on the west side of the Portland Metro area, the VIP Poker Club is operating at several venues five days a week, including—as of last Wednesday—The Game on SW Barbur. Other venues are Pyzano’s in Beaverton, Dublin Pub in Portland, Hanko’s in Lake Oswego, The Jungle Room in Cornelius, and The Hubbard in in Hubbard. No idea what the payout structure is, but presumably the folks at Full House can clue you in on that. Prices are $200 per seat, $350 of you buy two entries, and $500 if you buy 3. It’s the first weekend of the month, which means I finally have something out of the ordinary schedule, even if it is on the monthly schedule. It’s time for the Final Table First Friday $20K Guarantee. I know I’m eager, especially after missing Friday’s weekly $10K there and the weekly $10K at Portland Meadows at noon on Saturday. The Wynn Fall Classic‘s $400K Main Event is this weekend. It’s a $1,600 buyin three-day tournament, with starting flights on Friday and Saturday. Heartland Poker Tour has an $1,100 Main Event with entry days on Friday and Saturday at the Peppermill Casino in Reno. Deepstacks Poker Tour Casino Yellowhead finishes off with a Main Event (C$1,100 buyin) that has a C$300K guarantee and starting days on Thursday, Friday, and Saturday. Thursday, Friday, and Saturday are three more entry flights at the Bicycle Casino for the SoCal Poker Championship $3M guarantee. You can also buy into Day 2 directly on Sunday for $4,500. Monday is the first of four entry days to a $150K guarantee with a $180 buyin. The Venetian‘s October Weekend Extravaganza starts Thursday with a $250 buyin $80,000 guarantee and other events. Next Thursday, the HPT moves to Thunder Valley. Kennewick, Washington is the host of the Tri-Cities Poker Championship next Friday through Sunday at Lucky Bridge Poker. It’s a $250 buyin, two-day event, with $2,500 added to the prize pool. That weekend is also the Full House Heads Up Championship (see above). WPTDeepstacks San Diego opens at the Oceans 11 Casino on Saturday, 15 October.